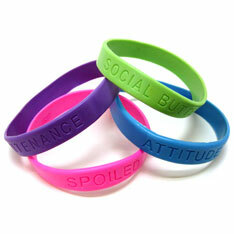 Elastic rubber bracelets come in 4 assorted colors with an inspirational message including: "Love, Strength, Hope, and Dream." $1.40 per dozen for 100 dozen or more. $1.20 per dozen for 200 dozen or more.